Personalized Recycled Grocery Totes, Custom Printed in Bulk. Promotional, Low Cost. Wholesale recycled and recyclable grocery totes, personalized with your custom imprint . Made from sturdy 100 grams per square meter (*GSM) premium quality non-woven polypropylene, 100% recyclable and reusable, with dual reinforced 20" carrying handles, hemmed opening, 10" side and bottom gussets with matching covered cardboard bottom insert. These tear resistant and water repellent grocery tote bags are made from recycled material. Silk screen imprint. 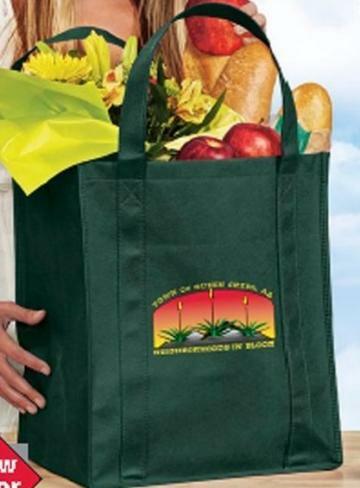 Our eco-friendly grocery totes may also be imprinted in full color (unlimited number of colors, or even a color photo) at a small additional cost: see the Price Table bellow. We also supply wholesale blank (not imprinted) recycled totes: please subtract 20% of the unit cost. Budget Prices in the America for bulk eco-friendly grocery totes. American clients pay no taxes. Unit Prices below include your 1 color custom imprint on one side, or your full color logo on one side in case of the full color totes. Additional color or Second Side Imprint: add the amount shown below, per color, per side. Setup Charge is $40.00 per color. Assortment of tote colors is allowed. Setup Charge for Full Color Totes: $40.00 per side. Add $1.00 per tote for full color imprint on the other side. Production Time: 7 days after art approval ; Rush Production of 1-6 days is available: contact us. Production Time for Full Color Totes: 15 working days after art approval; Rush Production is not available. Smoky, leather look (see photos). Size 13 ìn. W x 15 in. H x 10 in. D (10 in. gusset). Material: Premium two-tone non-woven polypropylene, 105 GSM*, with look and feel of canvas. Recycled and Recyclable: Ecologically Friendly (Eco-Friendly). Production Time for Full Color Totes: 15 working days; Rush Production is not available for Full Color Grocery Totes.